Oil painting on canvas 24 x 39 inches / 82 x 99 cm..
James Seymour was the only son of James Seymour (1658?–1739). The elder Seymour (often styled Colonel Seymour) was described in his obituary in the Universal Spectator (27 January 1739) as ‘formerly an eminent Banker in Fleet Street, and reckon'd to have understood Diamonds as well as most Men in England’; but the only known evidence of his commercial activities is that he supplied plate for racing trophies, and was involved in organizing race meetings at Guildford. Of greater importance for his son's career was that the elder Seymour was (in the same obituarist's words), ‘a compleat Master of the Pen and Pencil’ (some heads by him are in the collection of the British Museum and the Huntington Art Gallery, San Marino, California). He collected pictures and ‘curiosities’, and knew many artists and connoisseurs; he was steward of the Virtuosi of St Luke in 1702, and a subscriber to Kneller's academy in Great Queen Street in 1711. Vertue's account of Seymour's prodigal career is difficult to reconcile with his prolific output. A large number of finished oils and numerous lively and spontaneous sketches in pen and ink and pencil are known (the latter well represented in the collections of the British Museum, London, and the Yale Center for British Art, New Haven, Connecticut). Seymour's paintings of horses lack that anatomical knowledge which Stubbs was to bring to the art. His originality lay rather in his ability to enliven the conventional horse portrait by conveying, sometimes humorously, some sense of the personality of a horse, and of its accompanying groom or dog. In his most ambitious work, A Kill at Ashdown Park (1743; Tate collection), this liveliness animates a scene in which some weaknesses of perspective and composition are obvious. 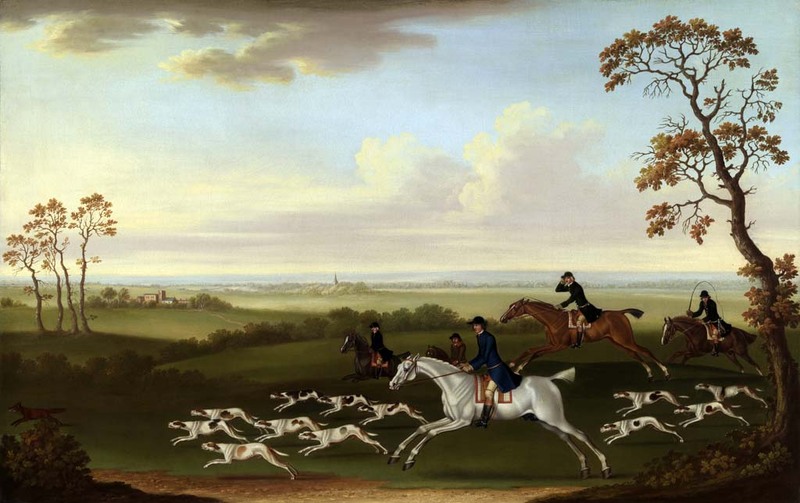 One of Seymour's finest paintings, Peter Delmé's Hounds on the Hampshire Downs (1738; Paul Mellon Gift, Virginia Museum of Fine Arts), commissioned by the banker Peter Delmé, gains from greater simplicity, as a small group of riders and hounds set off across the Hampshire downs in a palpably early morning atmosphere. Some of Seymour's finest works were painted for John Jolliffe MP, of Petersfield, Hampshire. Seymour's best-known painting, endlessly copied, was The Chaise Match Run on Newmarket Heath on Wednesday 29th of August 1750. The event was an improbable wager (the original painting is probably the picture in the Yale Center for British Art, New Haven, Paul Mellon Gift). Seymour's painting was engraved by Charles Grignion, published soon after the event, and often pirated. Numerous engravings after Seymour helped to popularize sporting art; these include Seymour's Twelve Prints of Hunters and Running Horses, Taken in Various Actions, mezzotint (c.1750), a series of thirty-four racehorse portraits, engraved in mezzotint with rococo borders, published 1741–54, and Twelve prints, representing managing and training horses, with coursing, shooting, setting, etc. (n.d.). Seymour appears to have been a friend and/or associate of John Vanderbank, whose profligacy Vertue similarly deplored; some of their drawings of haute école exercises in riding schools may well have been made sitting side by side. Vertue stated that Seymour's extravagances caused his father's bankruptcy, and that the latter part of the artist's life ‘was spent in the lowest circumstances & in debt’ (Vertue, Note books, 3.86). Seymour died, unmarried, on 30 June 1752 at lodgings in Blackman Street, Southwark. Seymour gained a favourable and great reputation for his pictures of racehorses and hunting scenes, many of which were engraved by Thomas Burford and Richard Houston. By 1739 he was 'reckoned the finest draughtsman in his way [of horses, hounds etc.] in the whole world' (Universal Spectator, 1739), and he was certainly preferred to his chief rival, John Wootton, by many sporting patrons. He was employed by Charles Seymour, 6th Duke of Somerset, to decorate a room at Petworth House, in Sussex, with portraits of his racehorses. Walpole tells a story of his truculent behaviour to the Duke when the latter took offence at Seymour claiming he was related to him. Seymour's paintings of the horse in its various attitudes are highly original. They display a stylistic naivety in which meticulous attention to detail and eerily static compositions somehow combine to create powerful and memorable images. The present beautifully preserved painting is typical of his hunting pieces, in a style which was taken by such followers as Francis Sartorius and Thomas Butler, and is carefully observed and meticulously painted. A similar painting is in the collection of the Turf Club, London.